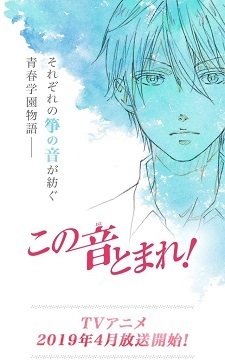 The official website of Kono Oto Tomare! revealed three main cast members for the series on Friday. Produced by Platinum Vision, the anime adaptation of Amyuu Sakura's manga of the same title will air in April 2019. The manga began serializing in Jump SQ. magazine in August 2012 and has 18 volumes in print as of August 3. Shueisha plans to publish the 19th compiled volume on December 4. Kono Oto Tomare! has a cumulative 2.5 million copies of its volumes in circulation. Jump Festa will feature a stage event for the anime at the Makuhari Messe convention center on December 23. Never have I ever wanted an anime adaptation to succeed more than this. Please god let this be given the love and care in production that it deserves. Nice casting with Tanezaki there. I absolutely adore her voice. She doesn't concern herself with all that idol nonsense. Just a pure voice actress with unique voice. Hope they're not ruin it. Yuuki Ono would of been perfect for Chika's character. Even when I started reading the manga, it was always Yuuki's voice I was hearing in my head whenever Chika was talking. I don't doubt he would've put a perfect performance of Chika's emotions. Uchida Yuuma's been getting a lot of main roles recently, which is nice since he's pretty good. I always imagined Okamoto as Kudou, but this is fine too. Can't say much about the other two seiyuu. I always imagined FukuJun as Kurata. Though, I'm more worried about the studio and the staff. The series' greatest strength is how is uses it manga art to present its koto performances, and lacking visuals will make the anime suffer pretty hard.